That notion of equality and humility before God is certainly at play in the photograph of the Obama family standing before the huge statue of Christ the Redeemer— in Portuguese, Christo Rodentor—that looms over Rio de Janeiro. The photograph—once again by White House photographer Pete Souza—was taken during the President’s first state visit to Brazil, the evening following the day that President Obama ordered U.S. airstrikes in Libya. The Christo Rodentor is 99 feet tall—just under 93 feet taller than the President—and weighs 700 tons. It is the fifth largest statue of Jesus in the world and is a national icon of Brazilian Christianity. 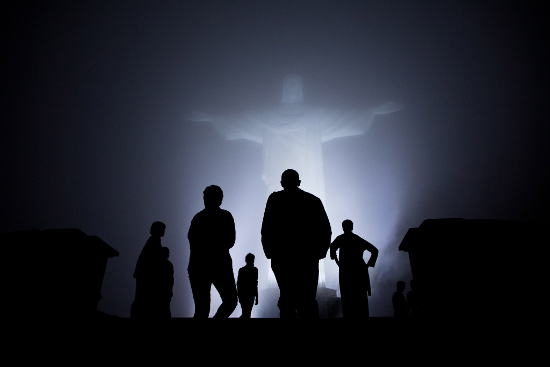 The photograph—with the looming Christ, arms outstretched, white-lit in the fog—appears to capture a group of nameless mortals called to account before God. The people are backlit and faceless, separated from one another, each of them with their head tipped up toward the huge and impassive Christ. Certainly, it is a reminder of human smallness, of our mortal imperfections and frailties in the face of the death, in the face of God. The photograph could be of any of us—the most or the least of us—called to account before an imposing deity. And yet, the longer you look at the image, the more it is evident that there is more to it than that. It is not just the humbling of a President before God, putting him on the same level of all of us who—presumably—will also be called to account. It is not simply an obliteration of power. Because even though the night is dark, the fog is thick, and the faces are unseen, the man standing in the center of the group staring down the glowing Christ is still distinctly recognizable as Barack Obama. So in this context, Pete Souza’s eerie and beautiful and haunting photograph—dare I say it?—deepens the metaphor offered by Jesus. It makes us wonder if perhaps–in our humble Republic—self-governance dooms the mighty. Because while most of us can afford to align ourselves with the meek, going about our private lives, rarely—if ever—making life and death decisions, the President does not enjoy those luxuries. Through our choices in the voting booth, we propel people like Abraham Lincoln and Barack Obama and those before and after toward the eye of the needle, where power and responsibility require them to make decisions that separate them from the rest of us. In the words of George Herbert, we are asking them to bow their heads and reply: “My dear, then I will serve.” Under the spell of the poem and the parable and the photo, we can wonder if perhaps we bestow both power and doom on these men. As President Obama said at his recent inauguration, he swore “an oath to God and country.” Jesus’s parable, George Herbert’s poem, and Pete Souza’s photograph call to mind a complex accounting before both. Wendy Willis is the author of Blood Sisters of the Republic (Press 53, 2012). She is the Executive Director of the Policy Consensus Initiative, a national non-profit organization devoted to improving democratic governance. Find Wendy Willis’ essay “Not Where He Is: Capturing the President” in the Spring & Summer 2013 print issue of Poetry Northwest.